A stateroom rendering inside the forthcoming Park Hotel Group, Melbourne. Melbourne will become home to the newest expansion of the Park Hotel Group, after the Asia-Pacific management firm announced plans to open in the Victorian capital in 2022. A new management agreement with Roxy-Pacific Holdings Limited will see the brand open in a mixed-use development comprising a 23-storey tower with 319 rooms and suites. The hotel will offer guest facilities including a lobby lounge, eighth-floor restaurant and bar (in which a new dining concept is still to be devised and announced) and five flexible meeting rooms which can be converted into a ballroom capable of catering functions for up to 200 people. 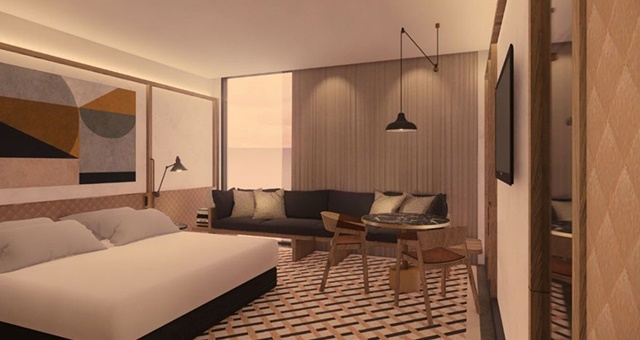 Interiors of the new Park Hotel Melbourne are being designed by Bates Smart, which has been tasked with envisaging an external façade reflecting the rich history of the old red brick look as it pertains to the history of the Little Bourke Street precinct. The new deal takes Park Hotel Group’s global portfolio to 20 hotels. “Backed by strong fundamentals and increased demands in the domestic and international visitor markets, I am optimistic and excited for Park Hotel to be a part of the vibrant hotel landscape of Melbourne, which has seen over 80 per cent hotel occupancy in 2018,” said Park Hotel Group CEO, Allan Law.